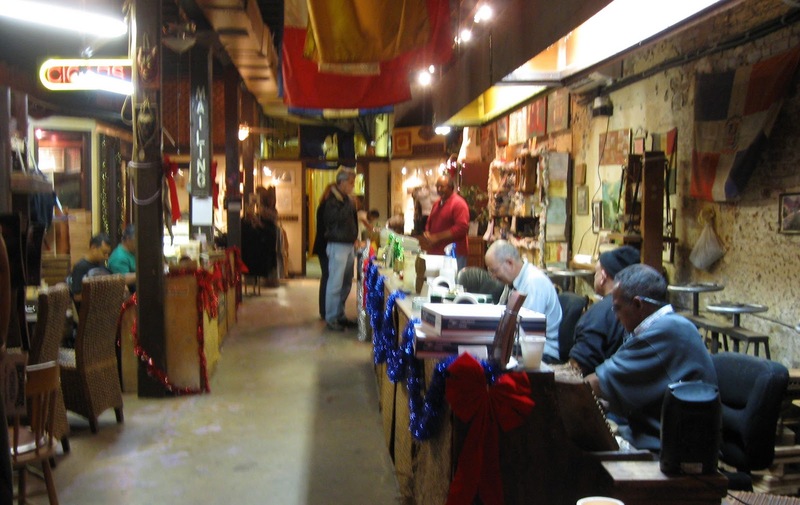 The Cigar Factory caught our eye on a pre-Christmas trip to New Orleans. Husband Walter and I are not smokers, dippers or chewers and ordinarily have no use for tobacco. On a recent trip to New Orleans, however, the sign pictured above caught my attention. Our goal was to visit the Christmas decorations Miracle on Fulton Street (See hubby Walter’s photos here). Right before we departed our hotel in the French Quarter, one of the 24-hour news channels was reporting on U.S. Customs confiscating thousands of dollars worth of super-expensive Cuban cigars. On our evening walk to Fulton Street, we cut over to Decatur, the street that runs by Café du Monde and Jackson Square, two of our favorite spots. 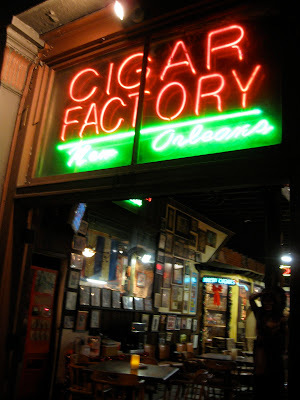 We had almost reached Canal Street when I saw the neon sign and darted into the factory. A number of men sat at benches facing each other with an aisle down the middle. The benches were stacked with tobacco leaves. What are the chances of hearing about Cuban cigars on the news then walking by a cigar factory just an hour or so later? I tried to snap photos of each step in the rolling process, but these guys were fast. They looked relaxed and leisurely, but every step was an economy of movement. Although tobacco is not part of my life, a glimpse at these pros at work was a treat. I have never seen a factory with a neon sign like that! I guess only in New Orleans. Very cool that you were able to go inside and take pictures for us! I would think the workers fingers would discolor badly, as I see they don't wear any kind of gloves. Funny thing is that my memory of tobacco/pipe shops is of a lovely smell, but I absolutely loathe smoking or even being near smokers! I think it's because I grew up with a mother who was a smoker. 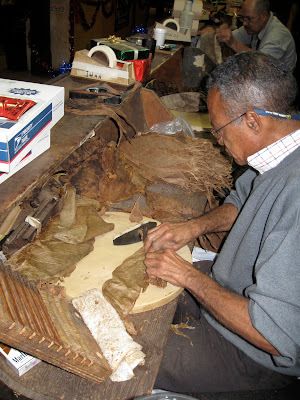 The cigar factory process looks amazing, I thought about the discolouration caused by nicotine too - and don't the workers get high just breathing it? We went to a cigar factory while in Nicaragua for a mission trip. It really had the "sweat shop" feel to it. Young men and women sat and rolled for hours with a very severe quota to make. I was struck by how stained the fingers and hands of the women were especially. The smell was so strong we really couldn't wait to get out of there. Thanks for sharing. I will have to go now and take a look at my pictures of the factory.